The ABM-1 Galosh (Soviet designation A-350) was a Soviet, nuclear-tipped surface-to-air anti-ballistic missile. The Galosh (NATO reporting name, formerly SH-01) was a component of the A-35 anti-ballistic missile system. Its primary mission was to destroy U.S. Minuteman and Titan intercontinental ballistic missiles targeting Moscow. The ABM-1 was introduced during the 1960s with mechanically steered semi-active radar guidance. It contained a high-yield nuclear warhead, comparable to the U.S. Nike Zeus. The ABM-1B (Soviet designation A-350R) was introduced with the advanced A-35M missile system and became operational during 1978. This system was tested at the Sary Shagan Launch Facility with five test flights during 1971, 1976, and 1977, with two more tests during 1993 and 1999. The next generation of missiles, introduced with the A-135 ABM System, were the ABM-3 Gazelle (1970s), and ABM-4 Gorgon (1980s). The missile design was done by MKB Fakel's Chief Designer Petr Grushin. The system had multiple radars during the different phases including the Pill Box and Hen House early warning systems, and the Dog House and Cat House target acquisitioning systems. The A-35 with radar was designed by Chief Designer K. B. Kisunko. The idea for this system was to protect Moscow from nuclear attack by the United States. The Russian government began studies during 1958 with preliminary designs from General Designer K. B. Kisunko. Further designs and development were moved to TsNPO Vympel. Radar systems were tested with Duna-3 single direction search radar and the Dunay-3U omni-direction 360-degree search radar, designed by V. P. Sosulnikov and A. N. Musatov, respectively. A more advanced system of radars were included, the Don-2N System; consisting of the 6000 km long-range early warning systems, (NATO code names Pill Box and Hen House), and the 2800 km short-range target acquisition radars (NATO codenames Dog House and Cat House). The A-350 developed through a period of growth and modifications. Configurations included an improved A-350Zh with tests during 1973. Eventually, the design changed again with radiation-hardened cases and became the A-350R for Phase 2 deployment in 1974. Declassified UK Ministry of Defence drawing created from Red Square May Day photographs and other intelligence sources. The construction of the ABM-1 system began during 1962 with 16 primary sites including command post, radar installations and firing complexes for 8–16 missile launchers. Some of the existing sites of the old SA-1 Guild were modified. Some known locations are: Naro-Fominsk, Olenegorsk, Skrunda, Angarsk, Nikolaeyev, and Sary Shagan. One of the Dunay radar (NATO Code : Dog House) phased array radar systems was located at Naro-Fominsk. This system is comparable to the US's PAVE PAWS radars of the Sentinel and Safeguard ABM programs. The construction plan changed a number of times, varying the locations, sectors or quadrants, and number of launchers. The system finalized at 8 sites with total of 64 launchers, with 4 major radar centers completed. 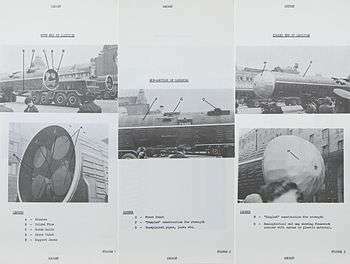 Intelligence photographs from a declassified UK Ministry of Defence folder of a Galosh ABM in the Red Square May Day Parade 1964. With on-going advancements in the ABM system, radars, missile and warheads, the evolution of the ABM-1 Galosh became the ABM-1B Galosh. The "M" for modernization, was brought on through the advanced developments at 10 different Russian institutes. One primary upgrade was in the Dunay-3U radar systems enhanced with a dedicated sector search abilility. Along with other upgrades, actual air tests were performed with different configurations between 1976 and 1977. Phase 3 of the Galosh went on-line in 1978. 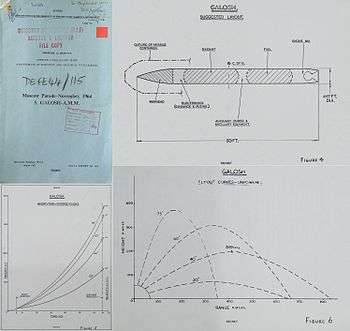 UK Ministry of Defence data reproduced from a declassified folder in the National Archives, London. 1 2 "NATO Designation-systems Index: Soviet Anti-ballistic Missiles (ABM)". Retrieved 14 November 2014. 1 2 3 4 "A-35". Encyclopedia Astronautica. Archived from the original on 18 July 2008. Retrieved 2008-08-25. ↑ "Astronautix: Sary Hagan". Retrieved 14 November 2014. 1 2 "Federation of Scientists: ABM-1". Retrieved 14 November 2014.